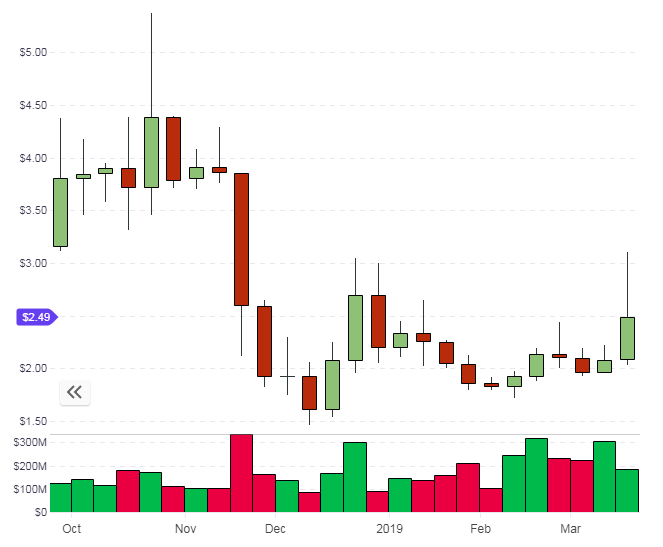 It was a solid week for the cryptocurrency market with all of the top 20 coins in the green and Bitcoin able to retest the key $4,000 resistance level, which could set the stage for further gains in the market. The rally of last week has also cleared some of the risk of another drop but continued gains are necessary to hold the momentum. BTC is stalling on Monday with a retreat from the resistance so we need to watch from the sidelines until we break key levels. As suggested in last week's article, Bitcoin is still the bellwether for price action but the action is in other coins and there is key movement in payment solutions that have the potential to take BTC's throne as a medium of exchange, two of which, Crypto.com Chain and QTUM, are discussed in this analysis. The move in CRO took the coin to a USD value of around $0.076. With a genesis date of November 14th, 2018 the CRO blockchain is only four months old and has certainly caught the market’s attention. 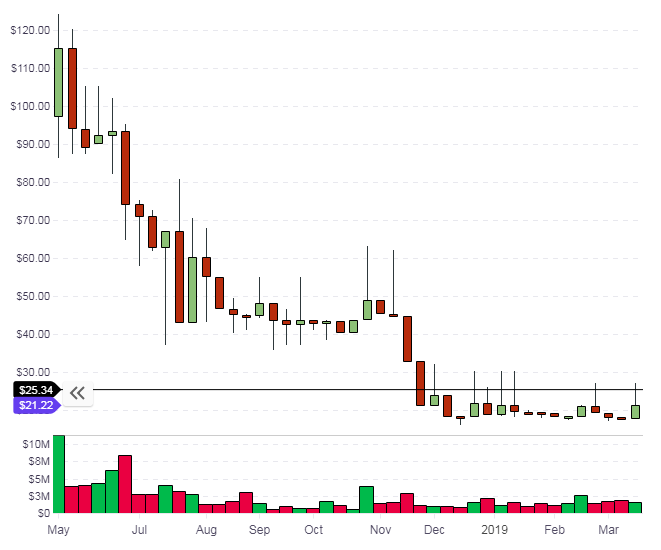 The chart below highlights the coin's performance versus BTC. One of the limitations to the CRO price may be an inflationary aspect due to the current supply of 4 billion coins being only 4% of the maximum stock of 100 billion, so investors should consider the valuation potential and be wary of profit-taking in the future. One of the attractions for investors may be the fact that the project offers its own pre-paid Visa debit cards. The MCO VISA cards offer fiat conversions to SGD, EUR, GBP, SGD, HKD, JPY, and AUD. They work in conjunction with the wallet and could be used as an off-ramp for purchases and to disentangle one's money from the mainstream banking institutions. You can see now why the likes of JP Morgan CEO, Jamie Dimon have been dismissive of Bitcoin and blockchain -- because these projects threaten their livelihood and the all-important customer deposits that allow the banks to set their leverage ratios. 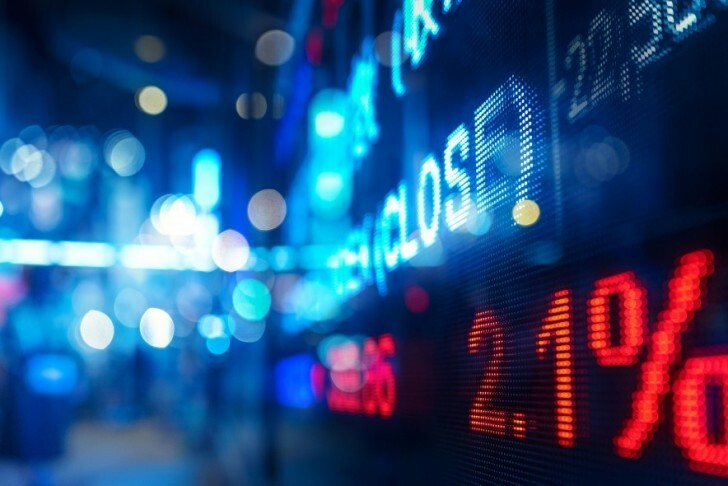 If there is another financial panic, the technology is in place that could see a revolution and it’s not hard to imagine a scenario where they lose some control of the banking industry. 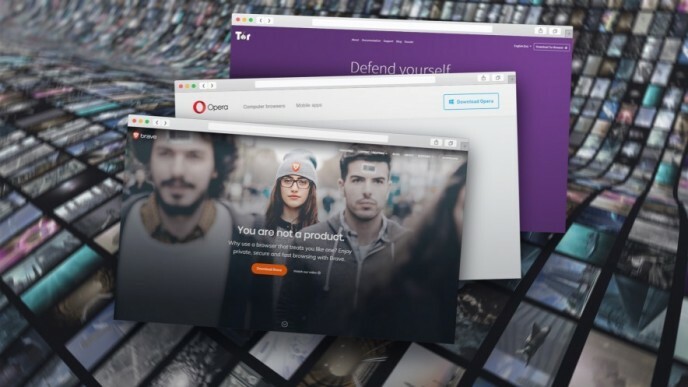 Another new feature that will boost the adoption of CRO is the payment solution. The native blockchain, Crypto.com Chain, powers the Crypto.com Pay solution which enables users and merchants to pay and be paid in any cryptocurrency anywhere, for free. 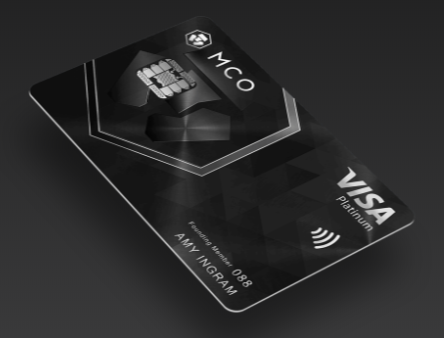 This payment option is a part of the MCO Wallet & Card App, and the MCO Visa Card is linked to Crypto.com’s MCO Wallet & Card App. This is a real threat to the business models of current providers such as Paypal, who have been criticized for their fee levels. The Crypto.com project is based in Hong Kong and started shipping MCO cards to Singapore-based customers back in October, so the price could really catch fire if the Asian consumers make strides to adopt CRO. BCH has been a strong performer on the week with a gain of near 20% on news of a coming blockchain upgrade. The “Schnorr Signature” upgrade is set to be implemented on the 15th of May and is aimed at enhancing privacy and performance. Despite the upgrade BCH is still having to shake off the negatives of a fractured community, with many high-profile backers, such as Dr. Craig Wright, having moved to support BSV. 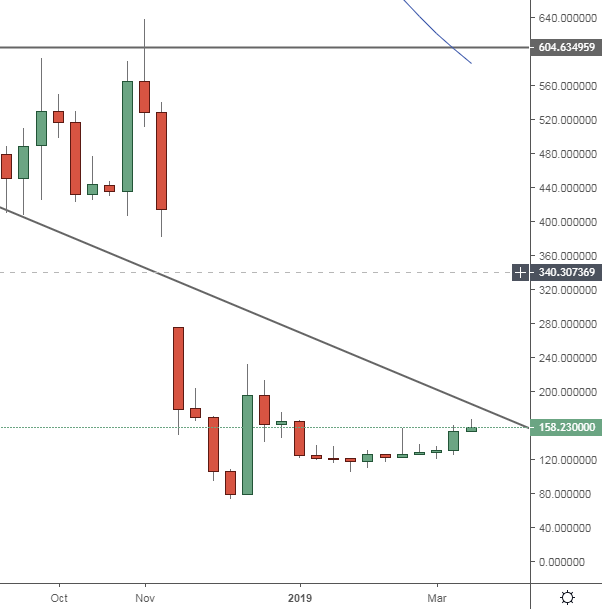 The move in BCH sees the coin trading just below the $160 level and a test of the downtrend resistance could be next. The "gap" between $280-370 would be a good target for further gains in BCH. QTUM has been in the news as the currency was added to the Zuex App, which is the first mobile payment application authorized by UK financial regulators. The mobile app provides banking, payments, and investment in one platform. We’re excited that Zeux has added QTUM to its app. This adds a tremendous amount of additional utility for our valued community who can now use QTUM for all point-of-sale payments with merchants that accept Apple Pay, and Samsung Pay. The Apple Pay and Samsung Pay reach has huge potential for QTUM and it may be a coin that investors will want to get involved in as piggy-backing the mobile payments giant should give it a head start over other cryptocurrencies when it comes to future adoption. Mobile payments are becoming very popular with the younger generation who are not emotionally invested in the days of bricks and mortar banking, so they would be easy adopters of crypto payment options if more mainstream attention comes. The gain in QTUM saw the token up 20% on the week at around $2.47 which gives hope, as with many other coins, that the mid-December lows will hold. QTUM now has a market cap of $200 million at number 30 in the list and this could be an opportune time to get in. With only 81 million coins in circulation, this is vastly lower than many of the other payment-focused coins, such as CRO, which as previously mentioned has a circulation of 4 billion. The reach of Apple and Samsung’s mobile pay networks could really change the price outlook of QTUM. Decred was another winner on the week as the coin announced its listing on another exchange. DCR will now be listed on OKCoin making it the first United States-based coin to be listed. Our listing with OKCoin provides us with a significant fiat on-ramp, which offers greater access and ease-of-use to those looking to join the Decred community. We’re building Decred to last for generations to come, which means giving coin holders a true stake in where the currency goes. The more participation in Decred, the closer we come to the ideal of a decentralized future ruled by the collective intelligence of a broad and robust community. The listing gave DCR a 16% boost on the week and, as noted with QTUM, there is potential that the lows of mid-December can be significant if the price can continue its advance. The $25.34 level is a strong support-level-turned-resistance and we would need to get above that to push back towards the $50.00 level in DCR.